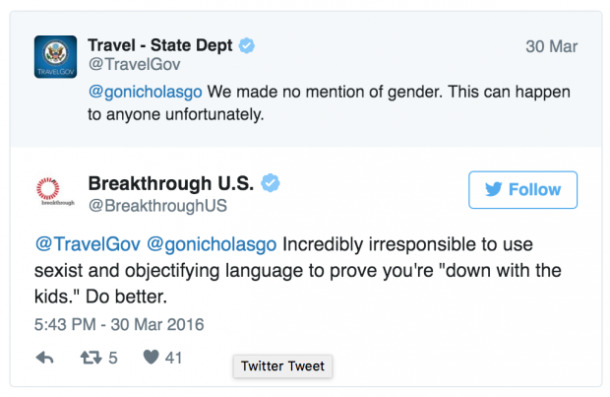 In a recent (and disastrous) attempt to warn people of the impending dangers of traveling overseas, the State Department pretty much went full-on Mean Girls to warn "ugly" people not to get their hopes up if a random stranger offers them a drink or tries to get cozy with them. …because if someone approaches their ugly asses for any reason, it isn’t because they find them attractive. It’s because they want to rob them. While others really just wanted to have fun at the government’s embarrassed expense. While the State Dept. eventually understood that they offended people and removed the original tweet, it doesn’t seem to have crossed their minds that they might have done something wrong. People aren’t 1-10 numbers, and shouldn’t be “rated” like they’re ranking pies at the County Fair. 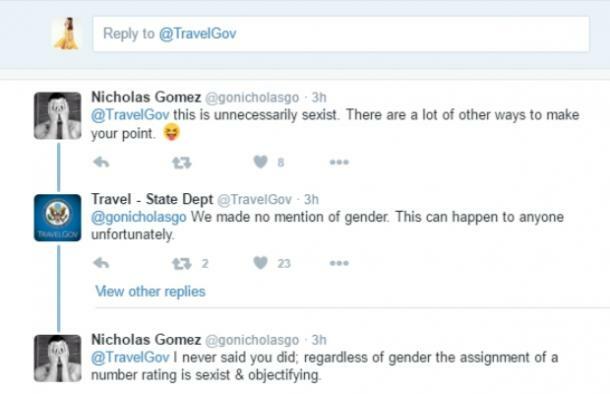 If we dig really hard through the objectification of the State Dept’s tweet, there is still some information we can garnish from it that might actually be helpful. If you’re abroad and someone attempts to lure you into a situation that makes you uncomfortable or makes you feel that the attention is superficial or unusual, please get yourself back to a safe area as soon as possible. It doesn’t matter if you’re male or female—if you sense that something isn’t right, trust your instinct. You are a foreigner in a country where people may or may not speak your language. There are documents that you must keep on your person in order to return home. There are situations where someone might try to con you out of money, goods, or even convince you to purchase something for them. These are situations that happen all around the world, and what we’re saying is, be careful. 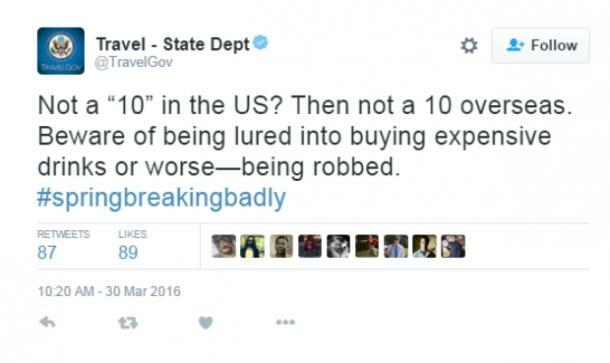 That’s all you had to say, State Department. We’ll try that one again later without the sexist commentary.